So many boom bap classics from one of hip hop's greatest duos that don't promote violence, they just have fun! 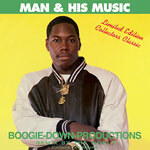 Roughly a year after the tragic shooting death of Boogie Down Productions founder, DJ and producer Scott La Rock, B Boy Records and KRS-One issued this special remix album, A Man And His Music (Remixes From Around The World). Billed as a Limited Edition Collector's Classic the project was released in a limited run -- briefly available in the 90s -- and now after years of being unavailable reappears as a tribute to one of the genre's early pioneers.